Local knowledge is an undervalued asset. Not even the locals themselves fully comprehend the extent of their own knowledge. Yet when they recognize something special, they can act on it in an instant. Meanwhile the rest of us might as well be on another planet. This is a story that demonstrates the power of local knowledge. I recently was on a group walking holiday in Costa Rica in Central America. I would never describe myself as a birder or twitcher and you don’t have to be one in order to appreciate the wonders of Costa Rica. Without a local guide, I would have missed so much because my eyes and ears were not attuned to the natural environment. Fair enough, but that’s not the story here. I could have pulled these facts from Wikipedia or a guidebook and you would be none the wiser. It was local knowledge that delivered the magic. When we first arrived in Costa Rica, Frank (our tour guide, photographer and fervent Iron Maiden fan) very apologetically warned the group that our bus would be sitting in a traffic jam on our way to the capital city of San José. Had this been a self-driving holiday, this traffic jam would have influenced my initial view of the country. Yet this is where the magic started. Frank used the time we were stuck in traffic to introduce us to Costa Rica and its politics. Trains used to criss-cross the country but past administrations had stopped the funding. Despite train lines still being visible, only a few local trains now run and all freight goes by road, making for busy roads with lots of large tractor trailers. 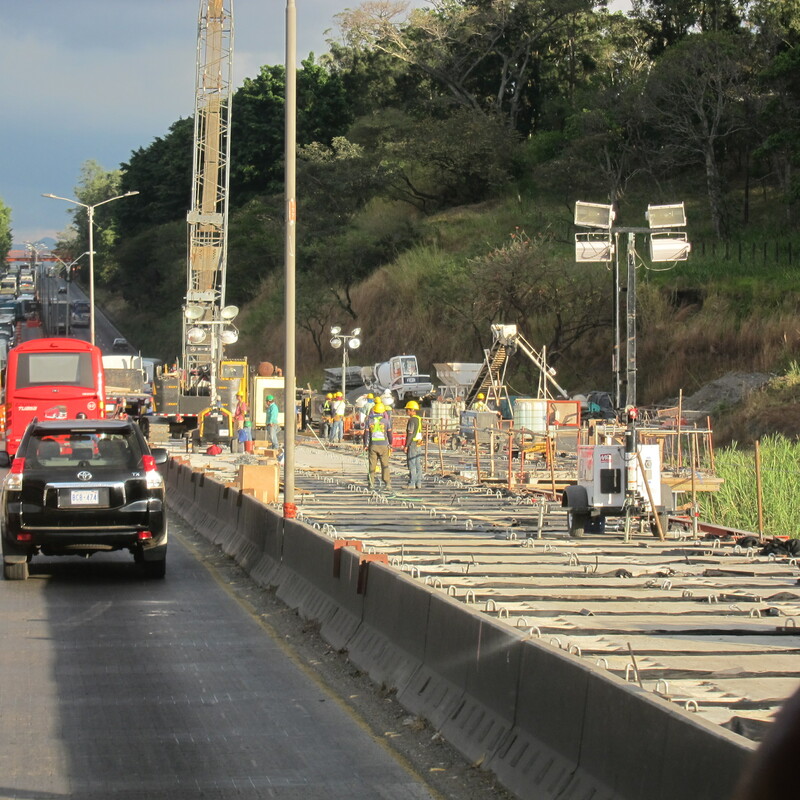 The main bridge from the airport into San José is on the Pan American Highway. For years this bridge has undergone repeated attempts at repair, always ending in failure due to political and industrial corruption. In 2014, the presidential candidate, Luis Guillermo Solís, campaigned against corruption and for investment in the country’s infrastructure. Upon being elected, Solís ordered a new bridge to be constructed alongside the old bridge. It is early 2017 and the new bridge is in the midst of construction. Until it is completed, everyone travelling this route sits in the traffic jam. Impatience to start our holiday was replaced with empathy and admiration for the Costa Rican drivers who displayed infinite tolerance and patience. As an aside, Frank told us that when he was a child, his step-father had been the chauffeur to a past president. His dad used to park the presidential limousine outside Frank’s modest family home when not driving the then-president around the country during the presidential 4-year term. Frank was and is very proud of that, and rightly so. A few days into our trip while driving across country, our bus slowed to a halt in the small town of Monterrey in Alajuela Province. In front of us in the road were a couple of well-dressed sabanero (cowboys) on horses. If that was not strange enough, both horses were doing a jig, not unlike the famous Lipizzaner horses of the Spanish Riding School in Vienna. As we watched, yet more well-dressed cowboys on horses appeared, and their horses too were doing a jig. 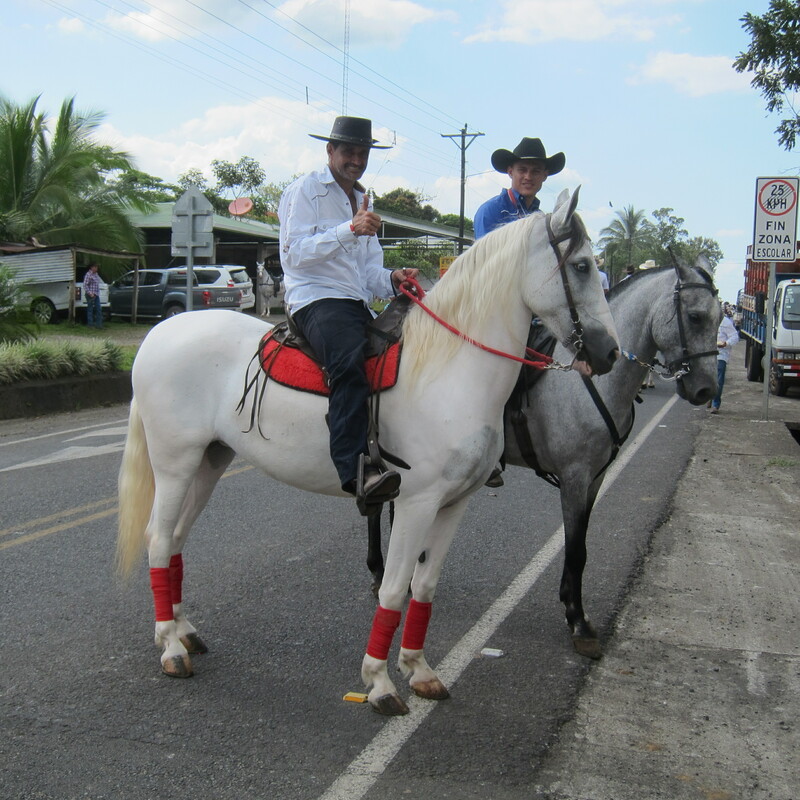 This, Frank told us, was a ‘tope’, a Costa Rican horse festival. This was the President of Costa Rica himself, Señor Luis Guillermo Solís, the man we knew to have commissioned the bridge on the Pan American Highway outside San José. President Solís talked to each and every one of us, in English, and insisted on shaking our hands. What a charming gentleman. We witnessed Frank talking to his country’s president, something he never dreamt would ever happen. Frank is a key contributor to Costa Rica’s ecotourism, educating tourists on the culture, history and natural environment of his country. It is only fair that he had a moment on his own with the President. Talk about this being serendipity. Our bus was crossing provinces, en route between hotels. 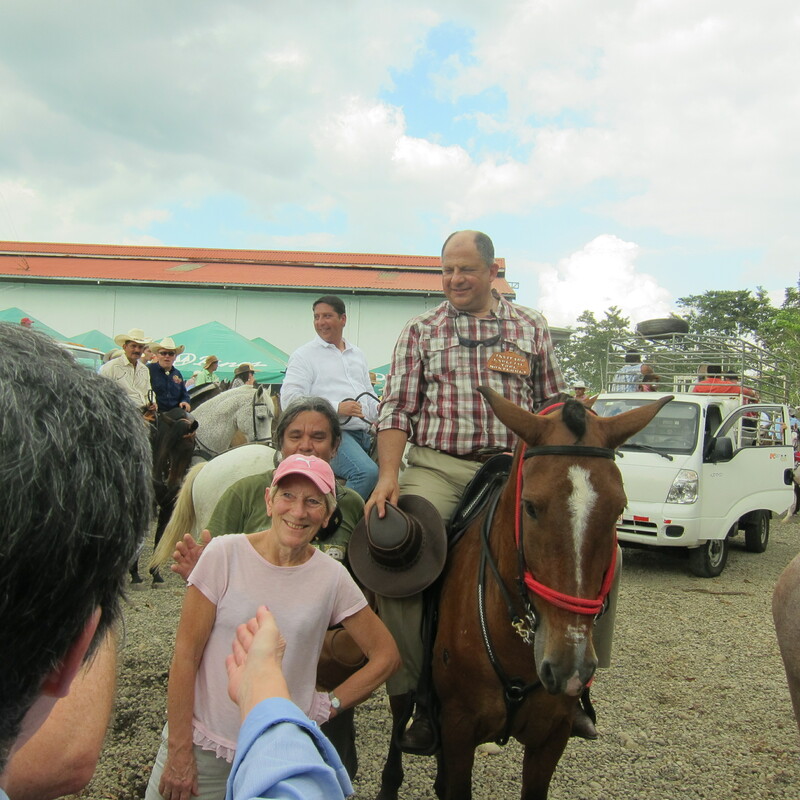 No-one knew that we would come across a horse festival, and no-one could anticipate that we would have the honour of meeting and talking to the President of Costa Rica. It was Frank’s presence of mind, his curiosity and his desire for his clients to experience this uniquely Costa Rican tradition that led to our being there. I don’t know who was more surprised that day: Frank or us, or indeed, the President and his staff. The President of Costa Rica appears three times in this story. The bridge, Frank’s Dad and the horse festival. Frank, our local tour guide, was instrumental in sharing each instance with us. And yet he had no idea that this would end up as one inter-connected story. Now that, I think, is truly magic. And Frank, if you are reading this: peace, love and rock’n’roll. Postscript: The bridge has been completed and traffic is now flowing freely. No more delays into San José from the airport. Posted on 01/03/2017 03/07/2017 by Susan ChanPosted in KnowledgeTagged behaviour, Costa Rica, empathy, experiences, knowledge sharing, knowledge transfer, walk. What an honor Susan, thanks a lot for your kind words and specially for sharing all of this wonderful experience. Peace, love and rock n’ roll to you too!! !